The first of its kind; a printed, stand-up, ovenable pouch has been developed by TCL Packaging in partnership with B&G Products. 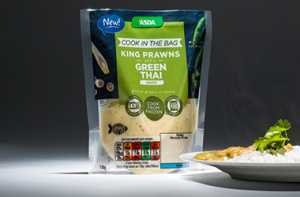 The pouch has been introduced this month on a new range of frozen, fish-based cook-in-the-bag meals in Asda, packed by Iceland Seafood Barraclough. The printed Doypack took 12 months to develop and is suitable for microwave and conventional oven cooking up to 200°C. The pouch can also be stored as frozen. The Doypack is made from a PET structure to ensure rigidity and stability during cooking with no reduction in performance. The stand-up pouch format is particularly suitable for microwave ovens as it fits easily inside and can be safely handled when the contents are hot and poured out for serving. The product was developed and extensively tested by TCL Packaging’s technical team working closely with B&G who developed a new bag conversion technique to create the pouch. It has been fully certified by Smithers Pira for food safety up to 220°C, 450°F Gas 7. Production utilises the latest ovenable inks and employs a new pouch-making conversion process which facilitates exceptionally strong seals, aided by high lamination bond strength. The pack also has good slip properties for easy handling during the packing process. Markus Jarvstrom, technical director comments: “This is a technically complex and innovative product that we expect to transform how certain foods are packed. The performance of both pack and print at temperature for both cooking from scratch and reheating has been extensively tested throughout development.